This photograph was taken in the heart of St. Johns in 1979, on the corner of N. Philadelphia Avenue and N. Lombard Street looking north. Remember when the #35 Trimet bus that services areas of North Portland used to be the #1 bus? 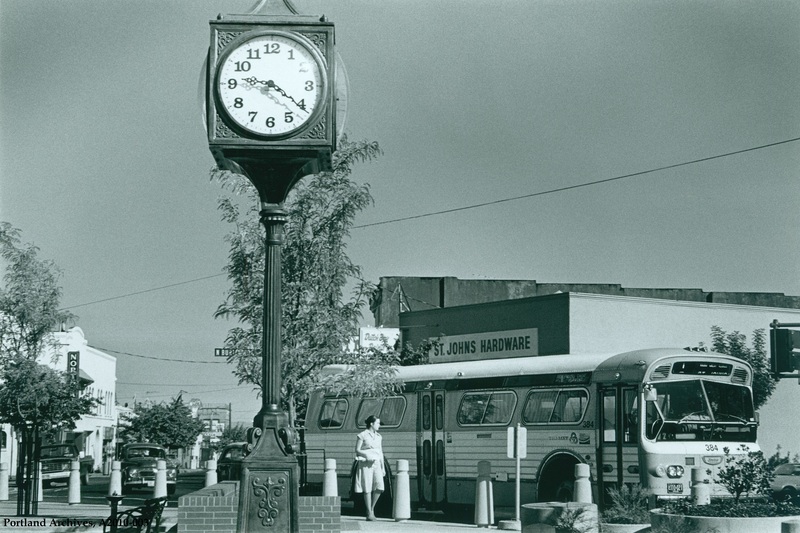 The clock in the photograph still stands today. Super slice of life photo. Thanks! Nice comparison to earlier photos of the same corner with a St Johns streetcar. On the left, you can see the St. Johns Theatre, which was called the Northgate Theater in the 1970’s. There is an early 50’s Dodge behind the bus, another looks to be 40-50’s car almost hidden by the bus, late 60’s Chevrolet PU and another almost hidden early 60’s car along with the bus. Notice the bus has no advertising on it, in the early days of TriMet they banned ads inside and out which was one selling points of why we should have publicly owned transit as opposed to private. Today they are rolling billboards with a lot more advertising than the old private owners ever thought of. So much for political promises and policy. And hi to the new moderators of this blog. I remember those windows would jam open sometimes. So we would all freeze on our (bright orange) bus ride home. As I owned both before, the car behind the bollards is a Volvo 544,(1959-66?) and the convertible behind the bus is a VW bug like I owned in ’79, maybe it was me?? The pickup is a mid ’70’s Chevy. Yea, the bus looks only too familiar too….sorry for all this minutiae my mind carries around. The early fifties Dodge is a sixties Volvo PV, the pickup is roughly a ’75 or ’76 Chevy and the car obscured by the back of the bus is a Bug convertible. When I was a kid I spent a lot of time riding those buses. Dave Brunker, looks like the current day rider can get a Starbucks while they wait. Mike G, I recall those Volvo’s were life-savers in a rollover. Since this was called the Northgate Theater, I assume it was owned by Tom Moyer along with the Eastgate, Westgate, and Southgate Theaters (as well as the Rose Moyer Theater and many, many others). If so, I pleasantly surprised that this historic theater did not face the wrecking ball that took down other historic theaters that were bought by Moyer’s TMT development such as the Broadway and Fox Theaters. Ahem, correction: I AM pleasantly surprised….. Yes, English IS my first language. Why do you ask? The Northgate (St. Johns) has been owned by the same family for decades. As far as I know, never by either Tom or Larry Moyer. By the way, it was originally named the Venetian. Boy, I sure screwed my auto ID. Think I need a new monitor, paint program or else glasses. Sorry, at least the bus was a bus.